UPDATE: Read the NJ.com report on the meeting here. “It’s about time” was the general consensus from those who attended an informal information session Thursday night regarding the long-planned overhaul of the notoriously tangled 295/42/76 highway interchange, a project decades in the making that is now finally set to begin. However, she, like many others, noted that the $800 million, eight-year project is far from perfect. That’s actually part of a different project, set to begin in 2016, according to John McCleerey, NJ Department of Transportation project manager for the 295/42/76 interchange plan. 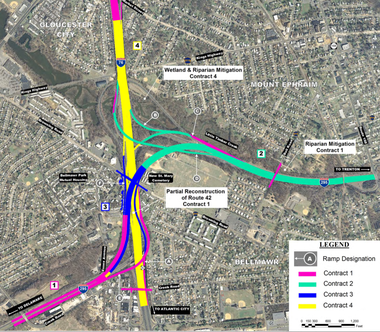 “The New Jersey Department of Transportation (NJDOT) will host an informal public information session Thursday night to discuss the project. “The project is expected to cost about $800 million over four contracts and its projected completion date is 2021. This entry was posted on February 21, 2013 by Barrington Bulletin in Region and tagged traffic.